Malaysian Prime Minister Dr Mahathir Mohamad left for his homeland on Saturday, following the conclusion of his three-day visit of Pakistan. 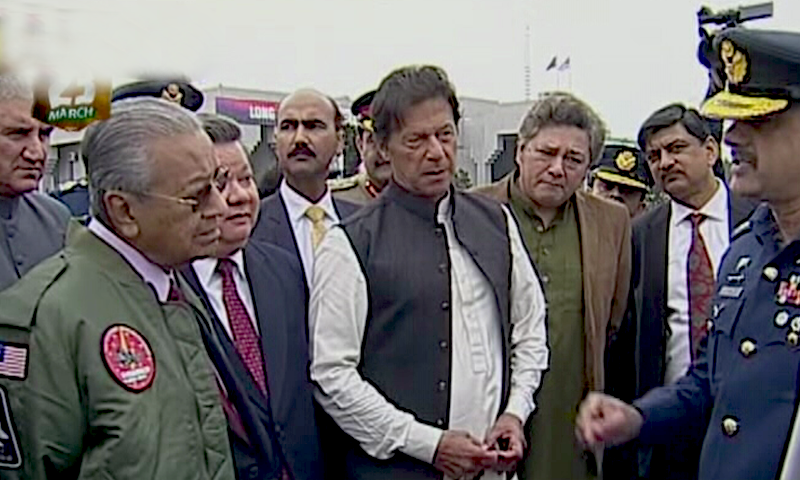 Prime Minister Imran Khan accompanied the Malaysian premier to see him off. Prior to his departure, Mohammad was given a detailed briefing on JF-17 Thunder fighter jets and also shown the aircraft's cockpit and interior. Malaysia and Pakistan signed Memoranda of Understanding (MoUs) for five "big projects" on Friday, Finance Minister Asad Umar had revealed during an informal discussion with journalists. During his visit, Prime Minister Mohamad was also given Pakistan's highest civil award — Nishan-e-Pakistan — by President Dr Arif Alvi during a ceremony held at President House.